Lonely Planet publishes a detailed guide to the best US road trips for those who like to travel with a plan. 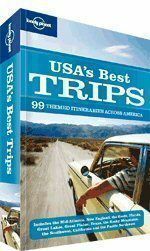 Aside from the first few pages that are filled with color photographs, “USA’s Best Trips” seems a bit dull. But don’t let the lack of luster fool you, this guide is a detailed bible to American road trips. The writing team offers quite a sense of humor in their eulogies of destinations. For example, when traveling to the Everglades, “everyone comes to see on weekends the inebriated owners trying to haul their boats into and out of the water.” The author goes on to say you can catch the “free show” from the deck of a marina restaurant. Each itinerary in the handbook is obviously well researched and tested by a writer — music playlists are even included for each region. That makes it ideal for anyone who wants their entire trip completely planned for them. With the most iconic and popular American road trips included (99 to be exact), there are plenty of options for national travel. If you are someone who likes to discover a new place for yourself, or if you prefer to have a quick guide for planning an itinerary, this book is not for you. The descriptions, although fascinating, are lengthy and leave little to the imagination. However, if you or a family member is a planner and prefers to have tried-and-true advice, then pick up a copy of USA’s Best Trips.